Click here for our UltraGard fitment guide. The Classic II Series of covers delivers the exceptional performance demanded by riders and defines the standard in high quality motorcycle covers. 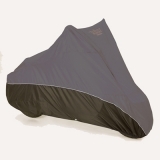 Available for motorcycles, scooters and trikes, the Classic II Series gives you a cover that is reliable, durable and stylish while out-performing your expectations of what a cover should be.